This Greek Marinated Chicken is hands down the most flavorful and juiciest chicken recipe I’ve ever tasted! Full of Greek flavors like oregano, garlic, parsley and lemon, this dish screams flavor! The secret to this chicken dish is in the marinade! Only 5 minutes to prep! Hands down people…HANDS DOWN the most delicious chicken recipe I’ve made. So flavorful. So juicy. Full of protein…even the marinade is full of protein! You’ve got to love that! I have now labeled this my absolute favorite grilled chicken recipe and that’s a big statement because I have some amazing chicken recipes here at Recipes Worth Repeating! Easy! – We all need easy in our life and this recipe is hands down super easy to prep and make. It only takes 5 minutes to whip up the marinade. Marinade – The secret to this recipe is the marinade. The marinade is full of flavor and made with a Greek yogurt base. Super healthy and full of protein. The marinade base calls for plain Greek yogurt. What an AMAZING base! It’s provides a creamy coating to the chicken which is super healthy! Yeah for Greek Yogurt! 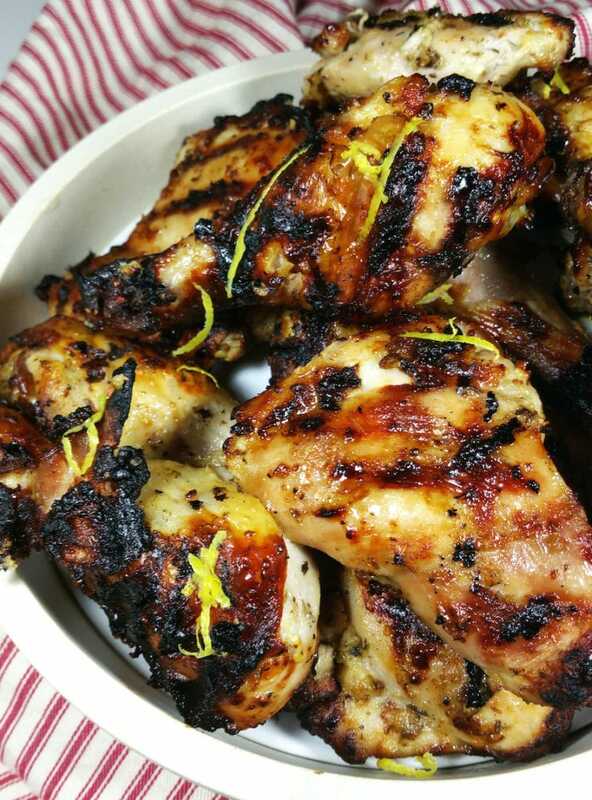 Chicken – Thighs, drumsticks or breasts…or all 3! Yep – you can use any kind of chicken you want! 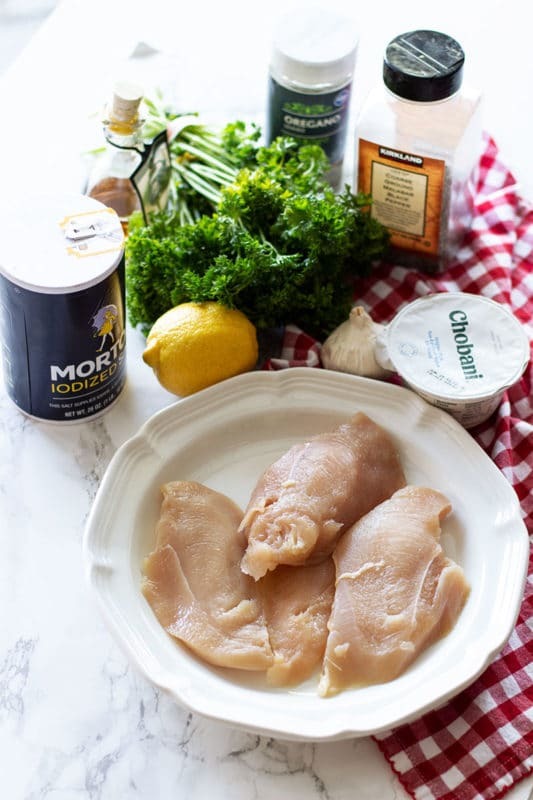 Simple ingredients – we’re talking chicken, garlic, greek yogurt, lemon juice, lemon zest, salt, parsley, oregano, garlic, olive and salt. All super simple and all healthy! Did I mention how EASY this recipe is to prep? Let me show you what I mean. You’re going to take every ingredient (except the chicken)….the garlic, Greek yogurt, lemon juice, lemon zest, salt, parsley, oregano, garlic, olive and salt and mix them well in a big bowl. Next, you’re going to take the chicken and put it in a large gallon Ziplock bag. Pour the Greek marinade into the Ziplock bag. Just look at that marinade! Thick and full of amazing flavor! Make sure you get ALL the marinade into the baggie. Close the Ziplock baggie and move the chicken around so that each piece is well saturated with the marinade. Toss the Ziplock baggie into the refrigerator and let it marinate. Once the chicken is done marinating, take the raw Greek Marinated Chicken out of the Ziplock baggie and place on a plate. Look how coated this chicken is after it has been marinated! Now it’s time to go start your grill! Light it up and let it get hot! Once the grill is good and hot, place each piece of chicken on the grill. Let it sit on one side for a good 3-5 minutes before flipping it over. When you flip the chicken over, you’ll see those gorgeous grill marks on each piece. FLAVOR I tell you…FULL of amazing flavor! Your chicken needs to get to 165 degrees Fahrenheit before you pull it off the grill or out of the oven. Once your chicken is done, pull it off the grill and it’s ready to serve. Look at this yumminess! Is your mouth watering yet…because it should be! I make this Greek Marinated Chicken with chicken thighs and drumsticks. You can use chicken breasts if you want, but I find using boneless skinless chicken thighs and drumsticks to be the best because they provide so much flavor. The dark meat has more fat than the breast so when I’m wanting” melt in your mouth” chicken, I go for the dark meat. Also, it’s easy to tell on the chicken legs when the chicken is done because the meat will slightly pull back from the bone! Again…there’s that word EASY! I always top my grilled Greek Marinated Chicken with fresh lemon zest. It helps intensify the flavor in every bite and let me tell you, every bite is FULL of garlic and just the right amount of lemon flavor. It’s just beyond delicious! I’m a big believer is using a flavored olive oil. 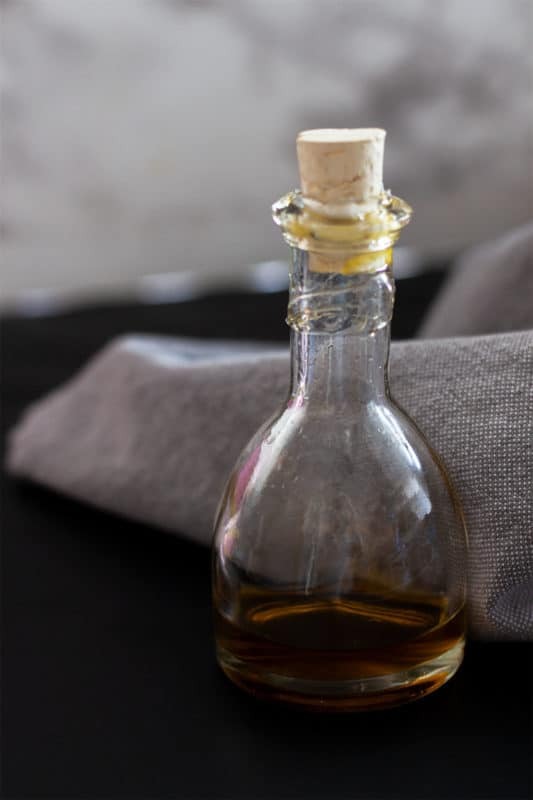 Any kind of flavored olive oil is great for this recipe! I’ve used a lemon based olive oil, rosemary based olive oil and garlic based olive oil. The flavor in the olive oil really makes the flavor “pop” when it’s going through the marination time. SO DELISH! For best results flavor wise with this Greek Marinated Chicken recipe, you will want to marinate the chicken overnight. I simply combine all the ingredients into a big ziplock size freezer bag, add my chicken pieces and move the chicken around in the marinade until all pieces of chicken are well coated. I let that bag sit in the refrigerator overnight. If you don’t have that kind of time, I recommend letting the chicken marinate for at least 1 hour. I don’t recommend always relying just on time. Time is just a gauge. Regardless of the cut, your chicken needs to reach an internal temperature of 165 degrees Fahrenheit before they are considered done. Keep this in mind when cooking large breast, thighs or legs. Use a meat thermometer to ensure the chicken is done before removing it from the grill or oven. Want those grill marks and char? Turn up the fire toward the end and turn over once. Just don’t let your chicken burn or overcook. To get those char marks, it’s all in your grilling technique. 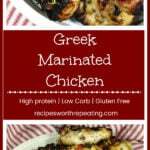 This Greek Marinated Chicken is gluten free and can be baked in the oven or grilled. Personally, I like this one on the grill but you do have that choice to bake it in the oven! Now…let’s get to grilling!! Happy eats, friends! Did you make this recipe? Please give it a star rating below!Make sure to FOLLOW ME on Facebook, Twitter, Instagram and Pinterest because ya’ll… I’m CONSTANTLY posting yummy food that I know you will love! Don’t miss out on the yumminess! This Greek Marinated Chicken is EASY and hands down the most flavorful and juiciest chicken recipe I've ever tasted! Only 5 minutes to prep! Full of Greek flavors like oregano, garlic, parsley and lemon, this dish screams flavor! The secret to this chicken dish is in the marinade! To make the marinade, combine the yogurt, olive oil, minced garlic, oregano, lemon juice, parsley, salt and pepper in a bowl. Stir well. Use a cheese grater or zester to scrape a thin layer of lemon zest from half the lemon. Add lemon zest to the bowl of marinade ingredients. Grab a gallon sized Ziplock bag and add the chicken pieces and marinade to the bag. Move the chicken around to ensure each piece is well coated. Refrigerate the the chicken in the marinade for at least 1 hour. I like to marinate mine overnight! The longer the marinade, the more flavorful! 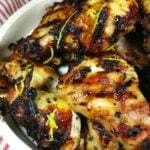 After marinating, you can choose to grill the chicken or bake in the oven. If you bake in the oven, preheat oven to 350 and bake for the breasts for 30 minutes. If you are making thighs and drumsticks, I like to cook them for 35-40 minutes to ensure done. If you choose to grill the chicken, grill for a total of 30-35 minutes or until the juices run clear and the chicken is done all the way through. Your chicken, regardless of the cut needs to reach an internal temperature of 165 degrees Fahrenheit before they are considered done. Top with fresh grated lemon zest and serve. I don't recommend always relying just on time when cooking chicken. Time is just a gauge. Regardless of the cut, your chicken needs to reach an internal temperature of 165 degrees Fahrenheit before they are considered done. Keep this in mind when cooking large breast, thighs or legs. Use a meat thermometer to ensure the chicken is done before removing it from the grill or oven. Update Notes: This post was originally published on July 18, 2017, but was republished with an updated step-by-step instructions, pictures and tips in May of 2018.
thanks for this recipe. Do you need to baste the chicken with the marinade while it’s cooking, or is there enough flavour already? Going to make it on the weekend! No need to baste it while cooking. The marinade has enough flavor to where it’s not needed. My best recommendation is to let this marinate overnight then grill. Enjoy and let me know how you liked it!! My best friend always telling me about her marinated chicken recipe, I can’t wait to share you Greek recipe with it, it sounds so flavorful. Share this one with her…I think she’ll love it! I’m a sucker for all of these flavors, this sounds so good! I can’t wait to try! You’re guaranteed to love it! Marinated and grilled chicken thighs are my go-to dinner all summer long. Cant’ wait to give this version a try – the yogurt looks like such a good marinade! This chicken looks absolutely amazing! I love anything Greek so I will definitely be trying this ASAP! I so wish food bloggers would have a check the box choice for those who comment on “how good this dish looks, I’d love to make it!” and reviews from those who have actually made the dish. What a waste of time to read posts other than reviews. I made this dish last night. The marinade is very good but I was so disappointed in the inaccurate baking time for chicken. I’m known for making juicy, tender boneless chicken breasts because I do not overcook them – 30″ at 350 max. The breasts I used were very thick and my mind is elsewhere right now so I went along with the 40 to 60″ at 375. I baked them for 40″ but the top did not have the light brown roasted look so left them in for another 10″. BIG MISTAKE! Like eating saw dust. At 375 they should not be baked longer than 30″, maybe even 25″ and don’t worry about a roasted color on top like I did. Can always broil them for a couple minutes if you desire. I hope this review was worth reading to those who actually want to learn something. Thanks for taking the time to comment. I’m really glad you liked the marinade. In regard to the cook time, note that my recipe calls for chicken thighs and drumsticks. The instructions state this: “After marinating, you can choose to grill the chicken or bake in the oven. If you bake in the oven, preheat oven to 375 and bake for about 40 to 60 minutes to ensure done. If you choose to grill the chicken, grill for a total of 35 – 40 minutes or until the juices run clear and the chicken is done all the way through.” Whenever I bake thighs or drumsticks in the oven, I typically cook them for 40-45 minutes. I appreciate your feedback though and agree 60 minutes is a bit too long. I’m going to go ahead and adjust my instructions. Thanks again for the feedback! Also – these taste better grilled. My pictures are from the grill and not the oven. When you bake them in the oven, they are not nearly as pretty as when they come off the grill! I hope you are able to make it soon! I’d love to hear how it turns out for you! Thank you Kristen for commenting on this dish!! So glad you and friends loved it!! Make sure to sign up for my newsletter so you get my latest recipes!! NExt time you make it, take a picture and tag me in social media! I want to see it!! Thanks you so much again!! I did not get the char at all. The flavor was great but the visual left a lot to be desire. Hi Odette, I’m glad you loved the taste but the char comes from your grilling technique. I tend to pop up the flames at the very end to get the char.